Let’s face it at this point in time event apps are a dime a dozen. There are good established event apps like Eventbrite and there are some new comers to the space that may prove to be disruptive. On the other side of the spectrum it seems that anyone who’s hosted a birthday party for their three year old has come up with an event app. BusyEvent is actually neither. Who are the founders of BusyEvent and what are your backgrounds? Brian Slawin: Since the mid-90s, Brian has been working in the events industry, designing, building and managing tradeshow programs and technology products for dozens of Fortune 1000 clients like Domino’s Pizza, HP, Ameriprise and H&R Block, Toyota AirSports and many others. A strong operational leader with a clear communication style, he has successfully managed cross-functional teams, has a demonstrated aptitude as a hands-on software engineer and managing the use of numerous technologies. David Schenberg: David is a veteran of the events industry with 20 years of experience designing, managing and selling technology that motivates people to meet and do business together. He has experience with major brands like AB, HP, M&M Mars, Domino’s Pizza, H&R Block, Ameriprise Financial, Marriott and Ritz Carlton. He leads the way in the use of emerging technology and his clients trust him to help navigate the ever changing landscape. 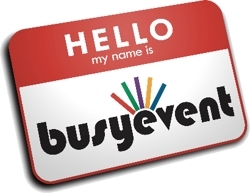 So is Busy Event a complete turnkey event management platform? We are laser focused on the live event experience that occurs before, during and after an event assuring that the most valuable data is available in real-time. By integrating our mobile tools with a variety of other non-competitive companies, we can provide a seamless experience from first communications, through registration, through onsite management, to well after the event is over. Who is your target user, what size events can you handle? Our target clients are the large event production companies that each produce between 10-30 events per year and the smaller event producers that manage some of the 21,000 tradeshows and conferences that occur in the US each year, alone. As you can see, the market and opportunity are massive for a suite of tools that enhance productivity and reverse the flow of revenue BACK into the event producer’s pocket. Because gomobile.pro is completely self-service, our professional grade tools are now available on a monthly subscription and at a cost that allows any event – from 50 to 250,000 attendees – to use them. What we’ve found is that even if an event isn’t a revenue producer (let’s say, it’s an internal meeting with the sales team), companies are swarming to gomobile.pro because of the flexibility the tools give them and the variety of tools they get access to. Can you tell us some of the events that have incorporated Busy Event? Our investor slide deck is filled with Fortune 1000 brands that we’ve worked for in the past 6 years since BusyEvent was founded. With clientele like that, we’re focused primarily on driving Return On Action (http://www.busyevent.com/blog/?p=382) and efficiencies. Some of our clients include: Domino’s Pizza, H&R Block, NBC/Universal, Ameriprise Financial, Hewlett-Packard, Microsoft, Anheuser-Busch, Coca-Cola, Yahoo! and the list goes on. What did you do before BusyEvent? David and I have both worked in the events industry since the mid-90s. We have each produced, designed, sold and managed hundreds of live events, tradeshows and conferences. Along the way, David worked as a graphics designer and technology lead at a number of large ad firms in St. Louis and I was an airshow performer and aviation professor at Parks College of Saint Louis University. What’s your experience been like in the Bizspark program? Awesome…absolutely the best! Let’s put aside the amazing financial benefits being part of the Microsoft BizSpark program provides like free and unfettered access to every piece of software Microsoft produces. That in itself would be reason enough to want to be part of the program. . . but that’s only the start. BizSpark is really about the people and the amazing talent that we can rely on to help us work through technical as well as business issues. It’s about the access to an ecosystem of companies large and small that are focused on helping and contributing and probably most importantly, it’s about the call out-of-the-blue that says “hey, can you help me”? Everyone wants to contribute and being part of an organization that lets you do that is really the best part. We’ve been Microsoft-centric from the very beginning of our company and even after we graduate from BizSpark, we’ll continue to reap the benefits of the efforts Microsoft. What are one or two of the hard lessons you’ve learned building BusyEvent? The most important lesson we continue to learn, every day, is to focus on the business, the problem you’re trying to solve and who you are trying to solve it for. It’s easy to get lost in the shiny object syndrome, wedging in another feature because it looks or seems cool. . . and people get lost in that bringing a bloated and inefficient product to market. Remember, the thing you’re doing isn’t for you, it’s for your customers. What’s Next for Busy Event? Scale, scale, scale which will allow us to flip the traditional tradeshow business model, inside-out! Our legacy product – BeLinker – was difficult to scale; frankly, it didn’t. But, we knew that our ideas were valid (from more than 20 years of working in the evens industry) and therefore we brought a viable product to our clients and worked like heck to create a footprint. We’ve been successful (and profitable) doing that but that’s not enough. Now, as 8 different forces that impact our market are evolving, we’ve reached a tipping point in the tradeshow market and we believe the challenges we’re addressing open a huge opportunity for event producers to provide better tools at a significantly lower cost while generating profits from their use. The dirty little secret is that event producers make a lot of money and that’s just not the case because most of the money that an event producer gets flows into – and then right out from – their event. So, what’s next is changing all that, providing professional grade tools and making sure that instead of being a cost center, gomobile.pro is a profit center. . . . We’re laser focused on providing that for our clients. From what we can see, it looks like St. Louis is really heating up for Tech Startups! You’re right and there are a lot of people working together to make that happen. For quite some time, St. Louisans have really been pushing on the same side of the rock and it lines up in four main areas: 1) The mentor groups like Innovate Venture Mentoring Service (IVMS), the IT Entrepreneur’s Network (ITEN) and other organizations like them have been working with St. Louis area companies for years. What’s really cool is that through these programs, we’ve met people we would have never had the chance to meet and gained access to their knowledge, experience and their contacts. I can’t tell you how valuable that is and how much fun it is to be able to invite the people you have heard of and seen in the news, to your offices for a meeting. 2) The funding groups like Arch Grants, Arch Angels, Capital Innovators, Cultivation Capital, Venture STL, St. Louis County Economic Council, WashU Idea Bounce and so many others are really making it financially viable for startups to grow and thrive in the region. By finding the best talent and most promising business ideas, supporting them with mentoring and funding and then making the region as a whole more attractive for startup businesses, it’s really gotten St. Louis on the startup map. 3) There are a lot of really smart people choosing to stay in St. Louis and grow their companies here. From bonfyre to Lockerdome, Aisle411, Yurbuds, Gremln and so many others. . . it’s all about combining talent with Midwestern tenacity for getting things done. We’ll soon see how the growth of those companies will make St. Louis even that much more attractive of a place to be and 4) The political entities have really gotten behind what the other groups are doing. Sure, it’s easy to poke fun at politicians with their perma-smiles, but when you really get into the nitty-gritty of things and need them to make things happen, they can and do and in St. Louis, they are. A great example of that is the JOBS act. A number of St. Louisans were very influential in shaping and making that a reality and it’s going to do really great things for the startup community in general and especially those regions (like St. Louis) that are quickly becoming more and more important to the start up world.